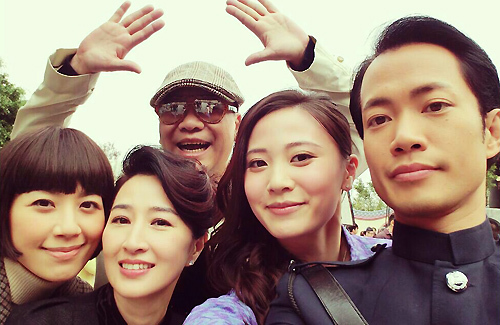 The cast and crew of Always and Ever <情逆三世緣> set out for Foshan on Monday to begin location shooting. Due to the rapid spread of the H7N9 bird flu virus in mainland China, many artists took extra precautions to avoid contracting the fatal illness. TVB also did its part to ensure public safety, cancelling a media on-set visit originally planned for Tuesday. In addition, the company rented out a local restaurant to serve its crew during the twenty-day work trip, eliminating risks of food contamination. While the production team departed together in chartered buses, Bobby Au Yeung (歐陽震華) and Esther Kwan (關詠荷) opted instead to travel separately in private cars. Ngo Ka Nin (敖嘉年), Mandy Wong (黃智雯), and Rebecca Zhu (朱晨麗) expressed concern about the H7N9 outbreak and have packed extra items for flu prevention. Pierre considers health a top priority and prepared extra bath towels, vitamin pills, disinfectants, and preventive medicine. He believes that they would be able to avoid any serious issues as long as care is taken. Mandy, who is also filming The Hippocratic Crush 2 <On Call 36小時II>, told reporters that she is feeling under the weather due to her busy schedule. Her family is very worried about her condition and has prepared face masks, hand sanitizer, and instant noodles to protect her from the flu. Since this is her first time filming in China, Mandy was looking forward to trying great cuisine but has now decided against it upon her family’s advice. Rebecca Zhu’s family also warned her against consuming poultry while in mainland. Her Silver Spoon, Sterling Shackles <名媛望族> co-star Damian Lau (劉松仁) phoned her earlier to warn her about the flu. “Damian is very worried about my parents who are living in Suzhou. He told me to ask my parents to put some garlic by their bed and windows to destroy bacteria.” Rebecca stated she will pay closer attention to personal hygiene. She plans to wash her hands and sanitize her environment more often to avoid infection. That’s really nice of Damien calling Rebecca to warn her about the flu! Yes, super sweet of Damien. He came across as a real fatherly figure. The way that the cast of SSSS spoke of him shows that he’s a genuinely nice and caring team player. Kudos to him! I had no idea that Damien and Rebecca were that close! oooo…another scandal in hk is about to erupt!!! Rebecca looks cute in the photo. I love Mandy, big fan, but her mushroom hair style in the photo just doesn’t suit her. Disappointed with the styling! esther is a really good actress. Can’t wait to see her!!! So since it is the “bird flu”, they are all avoiding eating chicken, duck or any “bird” type of animal?? Are all of the other foods safe to consume??? I also did not know that Damien is close to Rebecca. Rebecca’s parents live in Suzhou? I thought they lived in the US or a western country. I guess she would be worried. I hope they have a safe and fun trip in spite of the disease.